Over 30 years after their displacement, the Batwa people is still largely landless and many Twas find themselves having to re-create settlements in the forests. The article below highlights the harsh conditions of living and the consequences of climate change on the indigenous peoples of Uganda, who are for instance severely hit by malaria outbreaks since they were expelled from the areas where they used to live. In order to counter these negative effects, global strategy Reducing Emissions from Deforestation and Forest Degradation (REDD) could represent hope for the country’s indigenous. In the framework of REDD the Batwa, among others, could see their conditions of living improve thanks to the development by Uganda of a national strategy to fight deforestation and forest degradation. Three decades after being displaced, the Batwa and Benets also known as indigenous people are still landless. Today, climate change has created benefits to keepers of forests. Will the indigenous people benefit from this initiative? Moya said they have become landless and that repeated promises by the Government to resettle Batya and thousands of his colleagues have not been fulfilled. This is repeated at Bwindi Impenetrable National Park in south western Uganda where Batwa, a group of endangered pygmies gave up their ancestral homeland-the forest for the sake of conservation. The Batwa have been wallowing in misery in attempt to live outside the forest. Although displaced 30 years ago, Batwa and Benets are the latest victims of conservation Africa. More than half a Century ago, swathes of rangelands such as Queen Elizabeth National Park, Lake Mburo National Park, Katonga Wildlife reserve, Murchison Falls National Park and Kidepo Valley National Park were grazing lands for pastoralist communities such as the Basongora, Bahima in western Uganda and Karimojongs in north eastern Uganda. The pastoralists’ grounds were gazetted as protected areas where Uganda Wildlife Authority (UWA) is in charge and the pastoralists are seen as encroachers when they stray into the national parks or wildlife reserves. Apart from Batwa, Benets, the pastoralists are also referred to as indigenous people as they have a culture that is distinct from the rest of the tribes in Uganda. In addition to conservation, the indigenous communities are also facing impacts such as malaria which is related to the changing temperature broadly known as climate change. The climate change phenomenon refers to seasonal changes over a long period with respect to growing accumulation of greenhouse gases in the atmosphere. It is blamed for the receding glaciers on Mountain Rwenzori, Uganda’s changing seasons, droughts and floods are some of the effects of climate change. According to reports, providing a solution to climate change is part of the global agenda since it important for the formation of natural ecological systems as well as human economies and civilizations. Recent studies have shown that human activities since the beginning of the industrial revolution – manifested in fossil fuel consumption for power generation, land deforestation for agriculture, and urban expansion – have contributed to an increase in the concentration of carbon dioxide in the atmosphere by as much as 40%, leading to global warming. The Intergovernmental Panel on Climate Change (IPCC) has described climate change as “inevitable” in view of the numerous changes observed in the temperature of the atmosphere, oceans, and sea ice, in addition to some extensive changes in the climate cycle over the course of the 20th century. The IPCC report also points out that the most vulnerable people will be hit hardest by climate change. 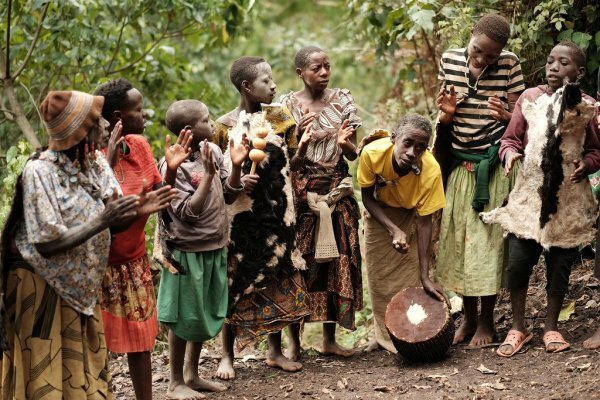 The Batwa and Benets who were forest dwelling people became displaced more than three decades to pave way for creation of protected areas, according to Nathan Makuregye, the deputy executive director at Pro-Biodiversity. According to Samuel Cheptoris, the Minister of Water and Environment, a fresh initiative that could help to enhance conservation and also increase forest cover also referred as Carbon sinks has come through Reducing Emissions from Deforestation and Forest Degradation (REDD). This is a global climate change effort to create a financial value for the carbon stored in forests, encouraging creation of policy approaches and positive incentives for developing countries to reduce emissions from forested lands. Uganda is developing a national strategy for addressing deforestation and forest degradation thus enabling the country to benefit from the REDD+ strategy. As part of the preparations to implement the strategy, a study was conducted to build the capacity of indigenous people to actively participate in both preparation and implementation phases of the REDD+ process. The researchers led by Gertrude Kenyange, a private consultant discovered that the UNFCCC (United Nations Framework Convention on Climate Change) is not yet domesticated by Uganda. In addition, the ILO Convention 169 on Indigenous and Tribal Peoples, 1989 is yet to be ratified by Uganda. When it comes to the National Tree Planting, the Forestry Committees have never been established since the National Forestry and Tree Planting Act came into force. Also the study realizes that the Tree Fund has never been established more than 10 years after the National Forestry and Tree Planting Act came into force. The National Forestry and Tree Planting Act does not assign any specific responsibility to local governments in the management of central forest reserves and does not provide for effective participation of Indigenous people, according to the report of the researchers. It only calls for Collaborative Forest Management between Government and Associations of people residing near the forest, but these communities are not ideally indigenous persons. Because of education levels, neglect and non-inclusion it is always very hard for indigenous people to organize themselves in to formal associations legally binding enough to be able to enter into agreement with government for Collaborative Management of forest resources. If these gaps are not addressed, they will affect the implementation of the REDD+ strategy and participation of Indigenous people, according to the report. the participation of indigenous people including Batya in the implementation of the national REDD+ strategy. Photo courtesy of Brian Harries.